When it comes to weather, the state of Florida is an odd place. In a climate that is known for heat and humidity, many residents in Tampa go the whole year without even thinking of their heating system. Some years, it even seems like winter season skips right over us. However, there are times when temperatures drop below 60 degrees — BRRR! That’s where a quality heating system can come in handy. 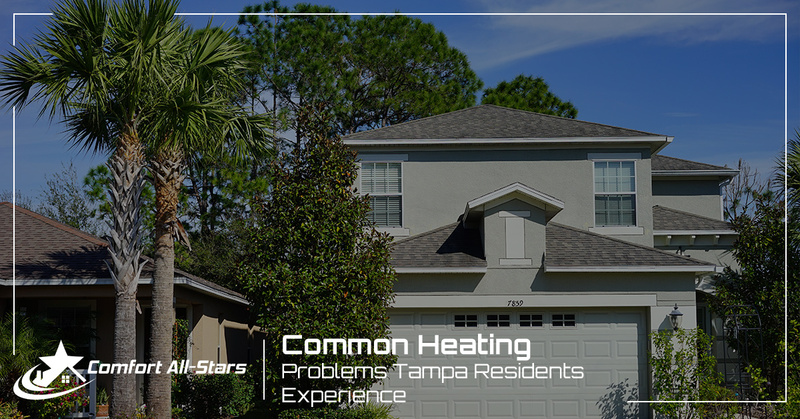 Typically, Tampa residents use their heating systems mostly from December to February, and if their heating systems are not functioning properly, it could lead to a variety of issues. Luckily, in this blog, we are going to share some of the most common heating problems that residents in Tampa often come across. Whether your furnace is old or new, unexpected problems can prevent it from heating your home efficiently. If your heating system doesn’t produce heat, it’s time to contact an HVAC company for professional maintenance. Before you call, remember to check the thermostat and make sure that circuit breakers that power your heater are working. If you’re like most Tampa residents, you may have to think to the time when you last used your heater. When you haven’t used your heating system in close to a year’s time, it is not uncommon for it to have a musty odor when you start it up again. However, the smell should clear up and disappear by the end of the first day of use. If the smell continues, a dirty or faulty air filter is the most likely culprit, but there can also be a deeper problem requiring professional HVAC maintenance. A typical heating system will kick on at varying points throughout the day, depending on your heating needs and preferences. If it seems like your furnace is running constantly, it could be a sign of a broken thermostat or more serious internal problems. When homes are poorly insulated, heating systems need to work extra hard to maintain the desired temperature. A furnace also may need to work harder to pump air through dirty air filters and ducts. If you’re unable to identify the issues, it’s best to call a professional HVAC contractor to pinpoint the exact issue. If your heating system is inefficient or has some underlying issues, it can have a drastic effect on your upcoming energy bills. If your heating system is using more power than usual to heat your home, it’s an indicator that it has become less efficient and needs to be serviced by an HVAC professional. If you notice the above signs with your heating system when you turn it on this winter season, contact Comfort All-Stars to get the problem fixed quickly. We not only offer heating repair to fix some of the issues above, but we can also offer heater replacement and installation for when you are ready to replace your old existing unit. Although we don’t always need our heating systems, the team at Comfort All-Stars is available to provide the heating services you need to stay cozy when the temperatures drop.